Last Tuesday was my sweet friend Laurie's Birthday. Yesterday i baked her a cake and we planned on going to the movies later in the evening. As soon as i made it over to her house Sense and Sensibility came on. We were sucked in an all of our other plans were thrown out the window! The 1995 version with Emma Thompson, Alan Rickman, Hugh Grant, and Kate Winslet, i have seen it a hundred times and i never get tired of it. 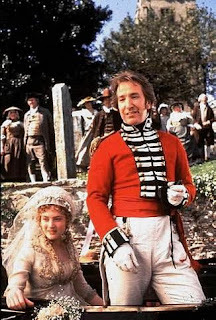 I always feel for Colonel Brandon's and his un-requited love of Marianne and i always cry when they marry at the end. I have always wanted to live in a little english cottage (i think i was born on the wrong Continent) and i take in every detail of the little cottage the girls live in and the gorgeous fashions of that era. I have never read any Jane Austen books :( so i came home and ordered the complete works of Jane Austen from Amazon. I am really looking forward to taking the book to the park for some spring reading! 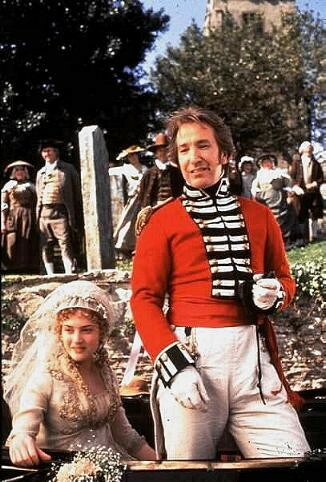 I always cry at the end when Marianne and Colonel Brandon Marry. I am in LOVE with Marianne's gorgeous wedding dress.